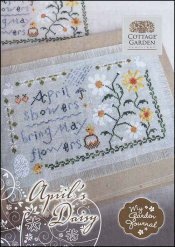 My Garden Journal: April's Daisy [C6585] - $7.50 : Yarn Tree, Your wholesale source for cross stitch supplies. Part 4 of 12 in the My Garden Journal series by Cottage Garden Samplings. Verse reads; "April showers bring May flowers". A little chick is sitting on a basket of yellow and white Daisies. The My Garden Journal series can be stitched alone, stitched together, or combine them to create a scrapbook journal. Stitch count 125w x 74h. Can be stitched on #8684 Belfast Linen Smokey Pearl.